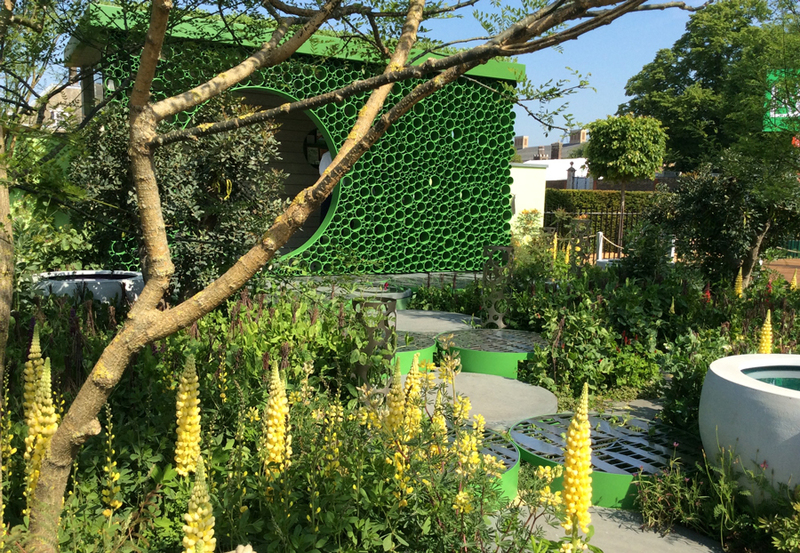 Here is our quickie overview of the Space to Grow gardens at this year’s (2018) RHS Chelsea Flower Show. This is a new category this year and I am sure that it will be a big hit with show visitors. 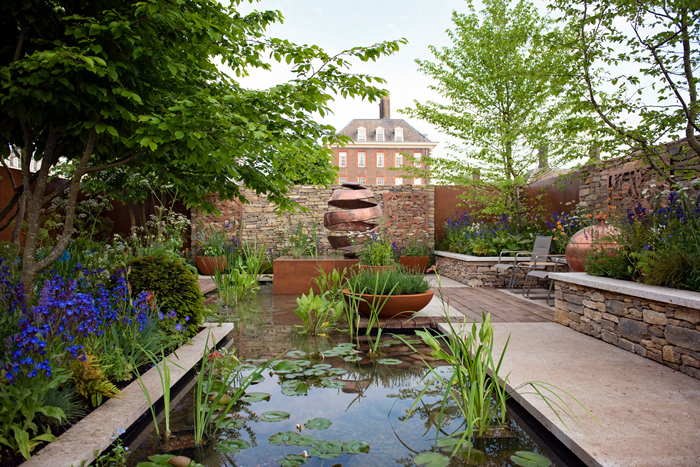 Each Space to Grow garden varies in style and planting, they are urban spaces that all deliver a message through their design and horticulture. We thought they were a brilliant addition to the show and hope they will be returning next year. Lots to take away from them for the urban gardener too. 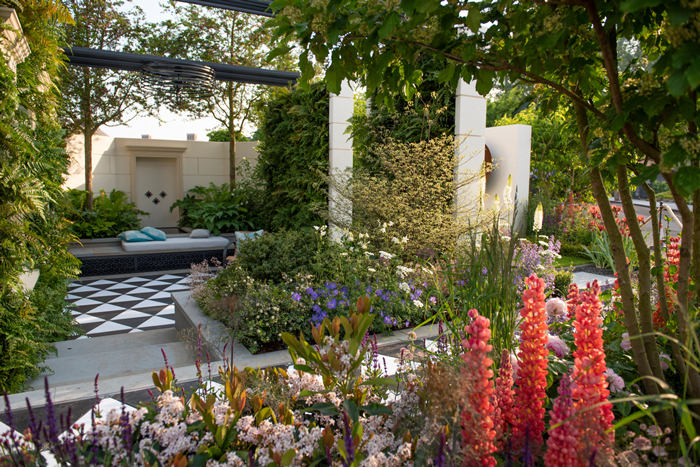 First off the lovely Seedlip Garden designed by Dr Catherine MacDonald (Gold) celebrating the humble pea – pictured page banner above – a really lovely garden with colours and multi-sensory elements all relevant to the pea. 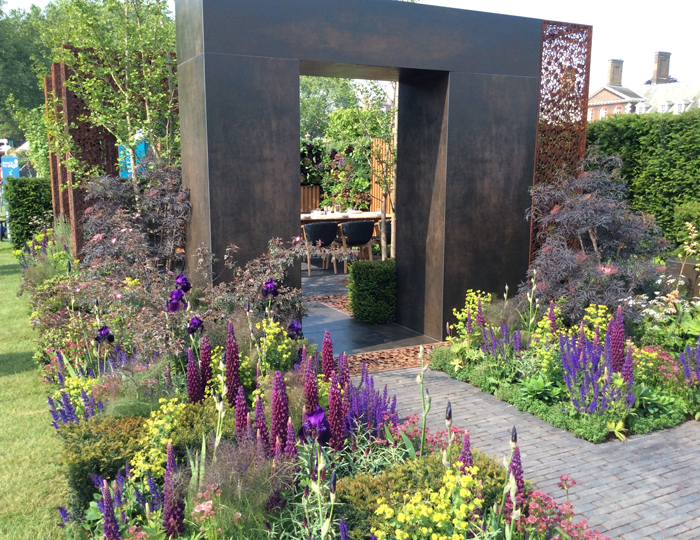 Loved the garden path, formed of circular elements, representing the form of the pea. 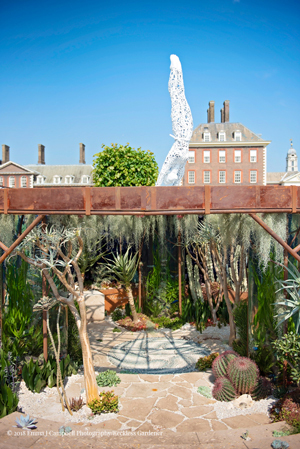 The Pearlfisher Garden (Gold) pictured left, designed by John Warland and the Pearlfisher team, is one of the most amazing gardens at this year’s RHS Chelsea. Celebrating the beauty of the vast underwater garden in our great oceans, it highlights the damage being done to our environment and particularly our oceans, by plastic. 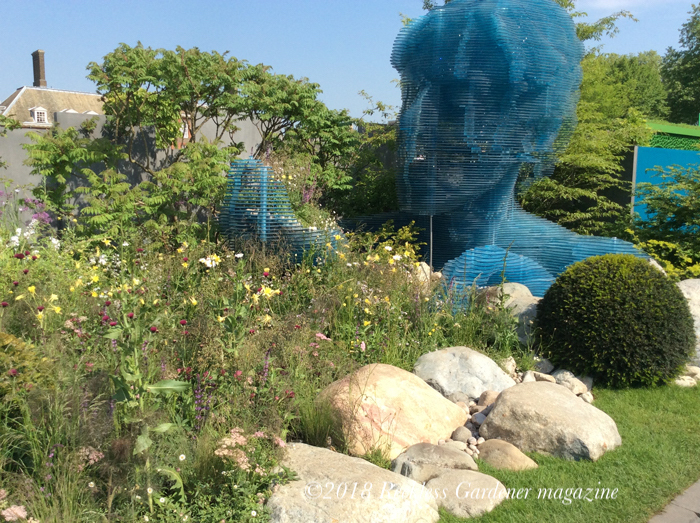 The Pearlfisher Garden, in partnership with Plastic Oceans, is fascinating. The garden consists of a series of below-water aquatic tanks filled with specimen planting including cacti, succulents and exotics. It provides a window to the world of our unseen treasures at the same time as highlighting and cautioning the irrevocable impact of plastic waste. As the team point out, 78 million tons of plastic packaging is produced annually, 32% of which is flowing into our oceans. This garden is a call to action to reduce the amount of plastic packaging we use. 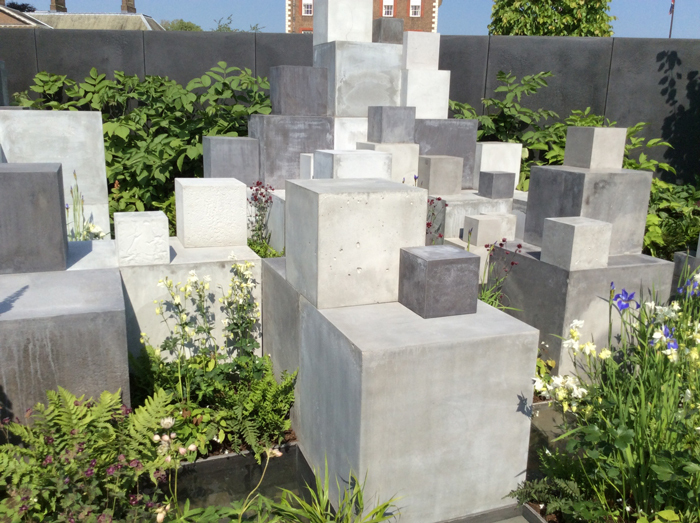 Chelsea is certainly a show of contrasting surfaces this year and the above garden, Skin Deep, designed by Robert Barker (Silver-Gilt) uses concrete blocks to represent people with varying skin conditions, softened by planting. 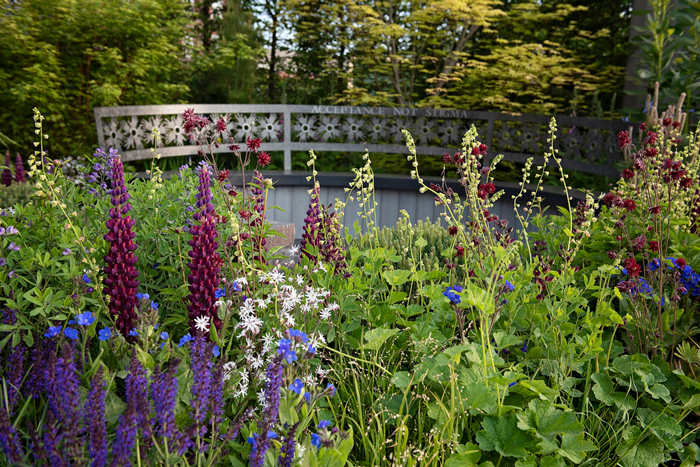 The texture of the various plants against the blocks softens the hard surface and also highlights the shades and form of the planting. All eight gardens have very distinctive identities and I particularly liked the fact they were situated side-by-side so no chance of missing one as you walk around. Photo credits: All photographs ©EmmaJCampbell Photography/Reckless Gardener.